Last month was the first time in my life when someone very close to me passed away. I have been in a writing slump because I wanted to write about my Mom, but really needed to step away for a while and gather all of my thoughts… and there are many about my Mom. In my early years, my Mom and I didn’t seem to get along well. There was the rebellious spirit in me that assisted in the situation, but there were plenty of other reasons of which I will leave out on this post because those reasons really don’t matter any more. Into my adulthood, things started to change a little. We would communicate frequently, but there was always something behind the scenes that would prevent our conversations from becoming intimate. When I started to fall in love with God in my early twenties, I sought her opinion on such matters but she said to me, “There are two things I don’t talk about with people – religion and politics.” I was a little floored about that. Here I was, wanting to talk about what was impacting my life and I couldn’t share my growing faith and questions with her. As I was drawn even closer to God over the years, God taught me how to forgive things of the past. My early childhood experiences started to become just distant memories to me instead of constant regrets. My thoughts of my Mom quickly became more about her life experiences and how she overcame them. I remembered that she had to live with the nuns in her childhood when times were difficult at home, even being separated from her siblings. I remembered that she had four miscarriages and she thought she could not have any children so she and my Dad adopted my oldest brother, Mike. Then boom, boom, boom… Tim, me, and Steve came along soon after Mike’s adoption when she and Dad didn’t think they could have any children on their own. I remembered that she had to raise four boys at home when my Dad was out at sea in the Navy. I remembered that after her and my Dad split, she tried to help out at home by working in a convenience store making $3.35/hr. Her only life skills at this time were raising her children – a Domestic Engineer as she put it, which was admirable to say the least. Sometimes we forget what it takes to raise children. She went from that situation to working for the government and eventually retiring from the CIA. What a great accomplishment for my Mom! I always told her that I thought I got my drive from her. I always told her that I was proud of her and her accomplishments. I told her that she gave me inspiration to continue in life, despite any hard times. I learned to love my Mom in the way that Christ loves me… unconditionally. In loving her this way, I began to see her as one that God loves too and so my times with her would be about her best interests and not mine. Loving her this way was very rewarding for me. I had the relationship with her that I always wanted as a youth. In her last 5 years of life, the one thing that always made my day is when she would tell me how proud she was of me and where I was in life. She told me she was proud of my walk with God. During her last couple of years of life we were able to talk about spiritual things and even pray together. Her last few weeks of life was a roller coaster of health. On the Thursday before her death I was told that I needed to come see her and I knew that this was going to be it… my last chance to be with her. So that Friday my wife and I headed over to Summerville, SC to see her one last time. I prayed along the way that I would get to see her before she passed. The nurses were holding off on giving her knock-out doses of morphine until we got to say something to her because after that she would not be able to respond to us. My brothers Tim and Steve had been there and were able to communicate with her. When we arrived we went straight to the bedside. I wept like a baby. This was it. This was going to be my last conversation with her and what was it that I was going to say to her? After weeping for a bit, I sat down by her side and just held her hand. I told her that I was proud of her and that I know that she has loved me and to have no regrets. I went back out to the car to bring her in the flowers I brought her. She loved flowers and always said to us “Don’t bring me flowers when I’m gone.” So I brought them in and she was told that I brought her flowers and she opened her eyes to see them and then closed her eyes and smiled. After a short time, I sat down by her bedside again and held her hand. I was given a cool damp towel to pat her forehead with to cool her off. She could not talk, but would muster out the word “pain” when she couldn’t stand it no more. The nurse upped her dosage and we were told that soon she would not be cognizant of what is going on. Me: Mom, do you love Jesus? Me: He loves you too and sees what you are going through. Some day there will be no more pain and suffering and He will come back to put an end to it all. Me: I want you to think about some things to look forward to. Imagine the big cats we will wrap our arms around in the new Earth (my Mom and I like cats). In heaven, you and I can meet for lunch under the big tree by the river and you can fix me lunch (during her last two years I would fix her meals when I visited). But you must know, the lunch you fix will have to be vegetarian because there will be no more death (I am vegetarian and she wasn’t). I talked to her about some other things to look forward to because I wanted her to not concentrate so much on her pain. I asked her if she wanted me to sing her a song and she nodded her head yes. So I sang Draw Me Close by Michael W. Smith. When I finished she was asleep and then I didn’t see her awake after that. Even though our lives together didn’t start out that well, I am forever rewarded by the way things ended and I will treasure that moment till eternity comes when I will see her again. I am happy how our relationship was the last eight years of her life. Please take my advice… If your relationship with someone needs fixing… Go fix it and live. 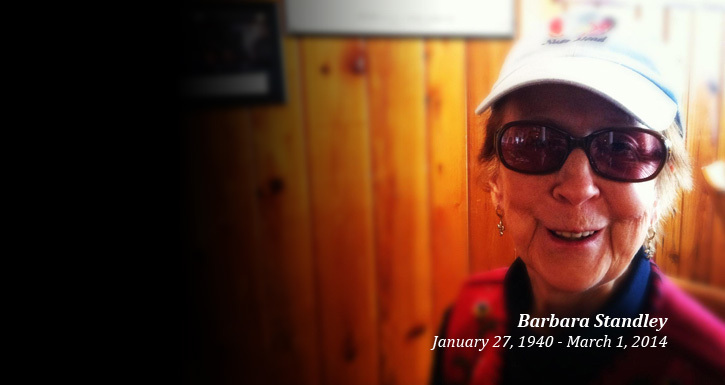 Barbara Standley died from complications of pulmonary fibrosis around 1:15am on Saturday, March 1, at the Hospice Center of Charleston in Mount Pleasant, South Carolina. What a touching tribute to your mom Kevin! I agree that we have a relationship that needs to be fixed we should do it! I’m glad you had that opportunity, I can’t wait until there is no more pain or death! Thanks Ivonne. I am looking forward to that day too! Beautiful post Kev. My sympathies for your loss. Trying to respond if I could get the tears out of my eyes long enough. That was SO beautiful and touches that place deepest in ones heart. I really felt you and your probable emotions when i saw that precious photo of you & your mom. That was just like me & my mom. I LOVE how you spoke to her, and her litte smiles… those are the SWEETEST gentlest smiles ever, aren’t they? Mom did that. I also talked to mom and told her I loved her and she didn’t need to worry any more, I’ll be ok, Nathan (my brother)& I will always take care of each other & that one day soon we’ll all be together again when Jesus comes,&how wonderful it will be. 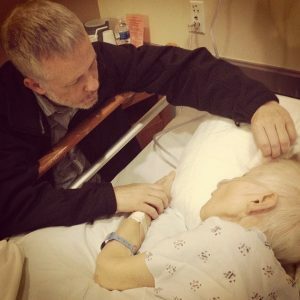 The last words she heard were from benjy beaty (boyfriend) who told her as he held her hand and named each one of us by name “loves her” & she can ” go to God”…….. & beautifully & peacefully,~~ she was gone. youre story was beautiful & I love how you and your mom bonded together. …after your childhood & all. Thank you for sharing this beautiful & personal part of your life with us. I really felt close to it since I just went through it. sending many hugs, much love & peace within, to you & your family. Thanks Amy. Those moments I will always cherish in my heart. Hugs to your family as well. That is beautiful. I pray for my son everyday. I hope our relationship can become a “good note” long before one of us dies. I have prayed many times for God to take me if that is what it takes to bring him to Jesus.